As Boca Raton and Coral Springs divorce lawyers, one of the most common questions we receive from clients involves concerns over potential loss of Social Security benefits after divorce, especially for those who subsequently remarried. However, it is important to note that getting remarried after your first divorce does not necessarily bar you from collecting Social Security benefits based on the first spouse’s record, as we discuss below. Let’s say, for example, that an individual who divorced early in life and remarried prior to age 60–where that second marriage ended in death or divorce–is now concerned about being able to apply for benefits based on the first spouse’s record because the first spouse was the high wage earner. In a nutshell, if this applicant is not currently married, they can still qualify to receive Social Security benefits based on the first spouse’s record. In order to be eligible, the first spouse (whose record the benefits are based on) must be deceased, at least 62 years old, or currently drawing their benefits (amongst several other requirements, such as the applicant being unmarried and entitled to fewer benefits than their ex). It is also important to note that the applicant should wait until they reach full retirement age before attempting to collect, or else they risk receiving a reduced benefit (note that your full retirement age depends upon the year that you were born). Also note that, as a divorced spouse, your benefit is equal to one-half of your ex’s full retirement if you wait until full retirement age. If your ex has not started receiving their retirement benefits, but still qualifies for them, you can still receive benefits on their record as long as you have been divorced for at least two years. It is also important to note that, even if your second or subsequent marriage did not last very long, you are not necessarily barred from also receiving benefits based on that marriage. For example, if your second or subsequent spouse suffered from an accidental death, you may be eligible to draw benefits on that individual’s record, as well as receive benefits based on the first spouse’s record. 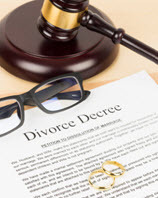 If you are contemplating divorce, it is understandable that you have many questions, some of them involving how divorce could affect you and your ability to take care of yourself and your family later in life. Our Boca Raton and Coral Springs divorce attorneys at the HVW Law Group have helped many clients throughout Florida to move forward with their divorce while ensuring that they are financially protected. Contact us today to find out more about our services. “I can't thank Emerald enough for walking me through a situation with a relative. © 2018 - 2019 HVW Law Group. All rights reserved.